Canada will not apologize to Saudi Arabia for speaking out on the kingdom’s jailing of human rights activists, Prime Minister Justin Trudeau said Wednesday.“Canadians have always expected our government to speak strongly, firmly and politely about the need to respect human rights around the world,” he said, addressing reporters in Montreal. “We will continue to stand up for Canadian values and human rights. It is something that I will always do.”Trudeau said Foreign Minister Chrystia Freeland had a lengthy talk with her Saudi counterpart on Tuesday, but he did not reveal details of the conversation.Presumably it was to discuss the brouhaha that erupted after Global Affairs Canada tweeted Friday that Saudi Arabia should “immediately release” two women’s rights activists and other “peaceful” activists languishing in the kingdom’s prisons.Trudeau added that dialogue with the Saudis is ongoing.“Diplomatic talks continue,” Trudeau said, “but as the minister (Freeland) has said, and as we will repeat, Canada will always speak strongly and clearly, in private and in public, on questions of human rights.”Saudi Arabia said Canada has no right meddling in the kingdom’s affairs and wants an apology.Since the Global Affairs criticism, it has recalled its ambassador to Canada, expelled the Canadian ambassador, froze new trade deals, ordered about 16,000 Saudi students to leave Canadian schools, told Saudi patients to get out of Canadian hospitals, stopped barley and wheat imports, and is selling off its Canadian assets. It has also cancelled all flights between the two countries.Analysts said the move is calculated to be a lesson to other countries that there are consequences if you meddle in Saudi domestic affairs, which probably accounts for the fact that Canada’s allies – in particular the U.S. and U.K. – have so far refused to support Canada.That led to a terse tweet from former Ontario premier and federal member of parliament Bob Rae on Tuesday.“The Brits and the Trumpians run for cover and say ‘we’re friends with both the Saudis and the Canadians’ – thanks for the support for human rights, guys, and we’ll remember this one for sure. Saudi reaction is over the top.”The Saudis are the largest buyers of military hardware in the world and it counts several Western countries as suppliers, including the United States, Great Britain and ironically, Canada. Iraq’s Foreign Ministry on Wednesday called on Saudi Arabia and Canada to resolve a dispute that has strained relations between the two countries. In a statement, the ministry urged Riyadh and Ottawa to “get over this stage and give priority to the supreme interests of the two countries” in light of “the long history of positive relations and need of mutual respect of sovereignty”.On Monday, Saudi Arabia expelled the Canadian ambassador and froze new trade ties with Canada, which it accused of interfering in its internal affairs after the latter called for the immediate release of jailed activists in the Kingdom.Saudi Arabia sells off Canadian assets as dispute escalates“While the sovereignty of countries and human rights are urgent necessities, the difficult circumstances surrounding the region and the world, the increasing tensions and the growing terrorism are equally important and necessary factors for the protection of international peace and security, " the Iraqi ministry asserted.US urges Saudi Arabia, Canada to resolve diplomatic rowOn Thursday, Canadian Foreign Minister Chrystia Freeland voiced concern over the detainment of human rights activist Samar Badawi, sister of jailed Saudi activist and writer Raif Badawi, and called on Saudi Arabia to free them.The Saudi Foreign Ministry said the "so-called civil society activists" had been detained on lawful terms and that Canada's request for their release was "interference in the Kingdom’s domestic affairs, against basic international norms and all international protocols". Saudi Arabia is selling Canadian assets in an escalating row after Ottawa criticized the arrest of a female activist, the Financial Times reported on Wednesday, citing sources.The Saudi central bank and state pension funds have instructed their overseas asset managers to dispose of their Canadian equities, bonds and cash holdings "no matter the cost", according to the report. 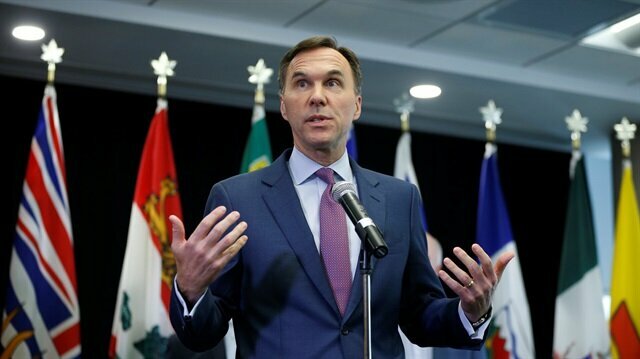 (https://on.ft.com/2M6CSjD)Saudis escalate diplomatic row with CanadaThe sell-off began on Tuesday and underlines how the Saudi government is flexing its financial and political muscle to warn foreign powers against what it regards as interference in its sovereign affairs, the FT said.Saudi Arabia froze new trade and investment with Canada and expelled the Canadian ambassador this week, in an escalating row after Ottawa urged the country to free rights activists.The Saudi Central Bank did not immediately respond to a request for comment. A representative with Canada's ministry of global affairs did not immediately have a comment.